bella donna's is a peaceful San Diego hair salon. Located in the charming town of Ocean Beach, our purpose is to provide quality hair care services that emphasize your unique beauty. Let our stylists help you create the perfect style. Every session is customized to help you look and feel your best. 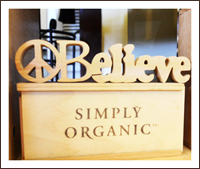 bella donna's is proud to be an earth friendly salon offering organic hair color. Great care is given to providing services and products free of harmful chemicals without sacrificing style. When you choose to visit bella donna's, you are choosing a healthier and more responsible way of beauty.